Though NCEM doesn’t have a radio ministry “department” per se, several of our missionaries are involved part-time in radio, helping to produce and broadcast programs especially for a First Nations audience. Among them is Tim Gradin who helps produce a Denesuline language radio program with Native missionaries Gilbert (& Laura) Bekkatla and Bobby (& Veronica) Moberly as speakers. Every week it is aired by the Missinipi Broadcasting Corporation (MBC), a network of FM stations covering the city of Prince Albert (SK) and over 50 other northern communities. 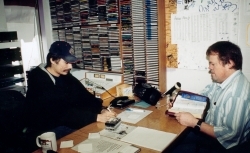 On Canada’s northeast coast NCEMers are also reaching out through radio. Several years ago Carl & Laura Sonnichsen initiated a weekly radio program on a community AM station. Airing time is free, and the broadcast is heard not only in Nain, but also throughout most of Labrador. Though radio has significant advantages in spreading the Gospel, we don’t intend for it (or any of our other media outreaches) to replace our personal ministries. We see radio as an effective tool in preparing hearts for the Gospel, for encouraging believers, and for effective assistance to our church planting missionaries.